This guide will help you learn about skiing in Las Lenas Ski Resort in record time. The best part? Everything here applies to making it happen in 2019. In other words: you don’t need to worry about reading out of date info…and there is a lot of it out there! If a ski trip to Las Lenas, Argentina is in your plans, you are in the right place. Let’s drop right in. Where is Las Lenas in Argentina? Las Lenas Ski Resort is located in the Mendoza Providence in Argentina. The closest town to the ski resort is Malargue (roughly 27,000 inhabitants), which is 50 miles (80 km) to the southeast. The nearest sizable city is Mendoza, which is 260 miles (419 km) to the northeast. Buenos Aires, the country’s bustling capital city, is over 620 miles (1,000 km) away to the east. Getting to Las Lenas is not as straightforward as getting to other Argentine ski resorts, but for many, the trip is well worth it. There is no direct flight from Buenos Aires, Argentina or Santiago, Chile to Las Lenas, but there are several gateway towns and cities a visitor can choose to travel through once arriving to Argentina or Chile. Charter flights depart on Saturdays from Buenos Aires to to the small town of Malargue. This is as close as you can get to Las Lenas via air. From Marlague the ground shuttle takes about 1 hour to arrive to your hotel in Las Lenas, depending on snow and road conditions. The charter+ground transportation is booked directly via the resort. Contact them here. Unfortunately they can be poor to respond so you may need to make several attempts to get through. PowderQuest no longer books flights to Las Lenas . If the Saturday charter flight does not fit your schedule, it is also possible to fly from Buenos Aires to San Rafael (AFA). The flight is just under 2 hours. From San Rafael, the drive to the resort is an additional 2 hours. Flights between Buenos Aires and San Rafael are daily on Aerolineas Argentinas. Finally, another option (albeit longer) is to travel from Buenos Aires to Mendoza via flight (or bus) followed by ground transportation from Mendoza to Las Lenas. Flights operate regularly between Jorge Newberry Aeroparque (AEP) and Mendoza (MDZ). Transferring from Buenos Aires’s international airport to its domestic airport takes about 1 hour, and the flight from Buenos Aires to Mendoza takes about 2 hours. See our Mendoza section below for more info. Buses depart daily from Buenos Aires to the town of San Rafael. The trip takes around 10-11 hours. From San Rafael's bus terminal there are daily departures at 10am to Las Lenas via Iselin bus company. Travel time 3 hrs. Las Lenas Resort offers overnight sleeper buses with meals on Fridays and Sundays from Buenos Aires bookable directly with the resort. Contact here. Not only is this one of the cheapest ways to get to the ski resort, but it’s also surprisingly comfortable. Although the journey is on the long side, first class seats on the bus are comparable to a bed. Just bring some good books, magazines, music and some ear plug and enjoy the ride crossing vast Argentina. You can also travel to Las Lenas from Santiago, Chile. If you are already in Chile or when flights from home to Buenos Aires are more expensive in comparison, this is a good travel hack. Start by flying into Santiago (airport code SCL). From here, to get to Las Lenas, you have an air option and by ground. Flights from Santiago, Chile to Mendoza, Argentina are only 50 minutes on LATAM or Sky Airlines. Book a window seat for one of the best views you will ever see of the truly massive Andes Mountains. If lucky you might even fly directly over the famous Portillo, Chile ski resort. Once in Mendoza follow the instructions we described in the upcoming Mendoza section to continue south to Las Lenas. By ground from Santiago is a different beast. It’s for the adventurous only and can take around 12 hours by car. The drive is stunningly beautiful. You will want an all wheel drive with good tires and snow chains as you need to cross the high alpine pass at Paso Los Libertadores. The pass often closes due to snow so stay up to date. Not up for driving but up for the ride? Several bus companies depart downtown Santiago to Mendoza. From Mendoza, there are multiple bus options to continue the journey south to Las Lenas. By now you know Mendoza is a travel hub to get to Las Lenas, but it should be noted it is a good 5-6 hour drive to cover the 260 mile road journey. One great way to break up the drive if you are traveling in a private vehicle is to stop for lunch at one of the local vineyards a few hours south of Mendoza. O Fournier is a popular stop. From Mendoza, there are numerous ground transportation options available, including shuttle bus services and private cars for hire. Coach bus service departs from the Mendoza bus terminal via bus company CATA Internacional. Tickets are purchased directly at the bus terminal. An incredible part of Las Lenas culture is the Marte chairlift, servicing terrain that has become a mecca for extreme skiing and snowboarding. From the steep bowl directly under the Marte chair, to Eduardo’s 48-degree Couloir, and literally hundreds of chutes 40-50 degree plus, some people have said they would give up every chairlift in South America for Marte! While the resort is know internationally for big steep slopes and off-piste, Las Lenas skiing and snowboarding for intermediates is quite good and a popular destination for families of varied abilities. The intermediate runs are nice and wide, with a good pitch. Even the Marte Chair offers long cruisers, and you will be rewarded with amazing views of the Las Lenas Valley and beyond. The ski and snowboard school has quality multi-lingual instructors many with international experience in Aspen, Vail, and Andora. The snow park is located near the TK Minerva lift in the center of the resort. Overall it’s a pretty basic park, designed for beginner to advanced intermediate skiers and snowboarders. The zone hosts several boxes, rainbows, rails, and a few small to medium size hits to air it out. Opens daily, weather permitting, from 10am-3pm. The base area just off the village has several Poma lifts, a good area for beginners, and the slopes are low angle and wide. The school offers group and private lessons for beginners. For non-skiers, there is a small shopping section in Piramide to pick up some over priced gifts, a casino, or the Piscis Hotel and Spa to spend the day relaxing. However a week in the Valley would get quite stale for non-skiers. If you have non-skiers in your group, and they are not interested in taking lessons, we would suggest the northern Patagonia town of Bariloche to base your vacation. Great non-ski activities and the ski resort is just a short 30 minute transfer from town. 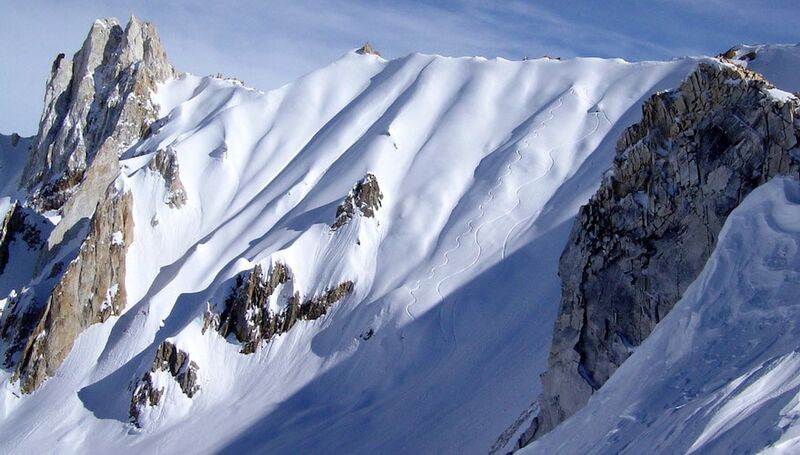 Words simply cannot describe some of the ski and snowboard terrain found in Las Lenas, Argentina. With more skiable terrain than Whistler, Las Leñas ski resort offers fun snowboarding and skiing for advanced to experts with a layout of 14 ski lifts and vast out of bounds all above tree line. Throw in the snowcat cat skiing tours, and easy backcountry ski touring and splitboarding access, you are in paradise for steep terrain junkies looking for the ultimate Andean buzz thriller. By now everybody knows that Las Lenas is the sickest resort in the Southern Hemisphere, with enough vertical and lift-serviced terrain to keep you busy for years. Off-piste options are absolutely huge and advanced riders will find hundreds of chutes and bowls and some of the best lift accessed terrain in the Andes, if not the planet. Many of these lines filter you right back into the resort so running laps on some of the best lines of your life are a true possibility when the conditions are right and you know where to go. If you do not know where to go it’s important to know that several chutes do not have exits. Others cliff out requiring mandatory air or a sketchy hike back out. We cannot express the importance of knowing where you are going and to always ride with avalanche safety equipment; shovel, probe, transceiver, and a partner you can trust. We highly recommend to join a guided tour with certified ski guides or hire a guide through the ski and snowboard school once you are there. It is important to note that there is no tree skiing in Las Lenas. If you want to ski trees in Argentina you should head south to Patagonia. The resorts of Cerro Bayo, Chapelco, and Bariloche’s Cerro Catedral have good tree runs. For backcountry terrain, the split boarding and ski touring options are truly endless. Ski bums, film crews, and pro athletes spend seasons here skiing Las Lenas legendary backcountry and exploring the mountains toward Chile. Some living in high end apartments and hotels, others in their cars or snow caves hidden up valley. Maps and guidebooks have been written covering the lines in and out of the extensive ski area. Leaving the ski area boundary requires you sign a form with the ski patrol. They will generally ask for your passport number and where you are staying. If you only have a week or two to ski South America, we suggest a guided trip to experience the best terrain and maximize your time enjoying it. The tour will get you priority access to the ski lifts, cat skiing, and two certified ski guides that know the terrain and where to find the best snow on the mountain. Joining a PowderQuest guided trip to Las Lenas resort you have priority lift line access which is a huge value as the line on the Marte chairlift can get very long. Most of the best terrain is located off the famous Marte double chair and the runs are long, really long. Some of our favorite steep leg burners are Eduardo’s, Paraiso, El Collar and even the Marte Bowl running under the legendary chairlift. As mentioned above, the options are world class and if you hit it right, it could be the best skiing or snowboarding of your life with over 15 miles of skiable runs. It’s important to note the Marte lift does close due to anything from high winds, avalanche danger, unusually cold temperatures or for no apparent reason at all, known as the “A-Factor”. When Marte closes, so does a good amount of the advanced and expert terrain. Other resorts occasionally have lift closure issues as well but do not affect us as much as a Marte closure. When Marte does close, they often open up snowcat accessed terrain for our tour guests and there are hiking options off the Neptuno chair. New Gondola Coming in 2021? 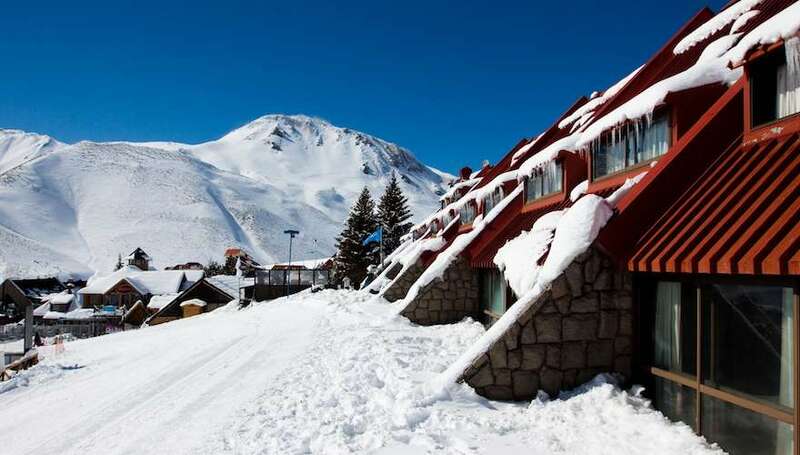 Argentina ski resorts like Cerro Bayo and of course Las Lenas have had rumors circling The Andes and the international ski world for year promising new gondolas. Finally, for 2021 it does appear Las Lenas will be adding a new gondola from the front side base area to somewhere around the entry to El Cartel. As news becomes official we will update here. The mythical Las Lenas Marte chair. 3,000ft runs back to the chairlift. Some of the world's best lift accessed skiing…when it is running. Then there is the backcountry. 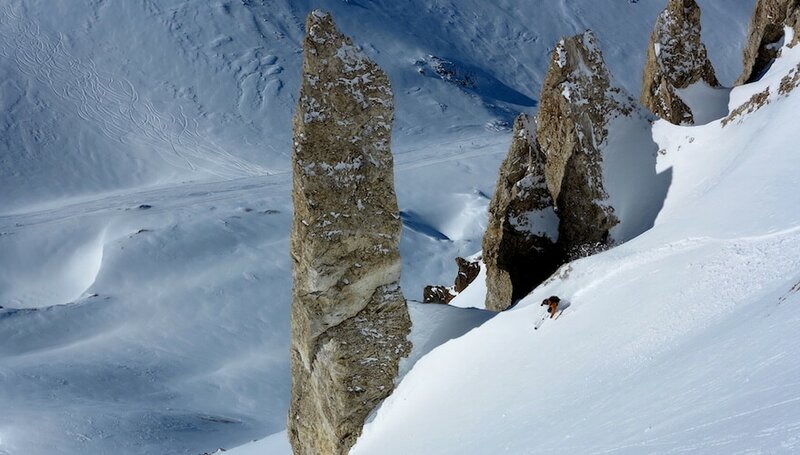 Spicy couloirs, alpine ramps, super spines. The party scene is almost as unforgiving. Many have missed a great ski day. Plan your partying for your down days or you will regret it! For lodging in Las Lenas, the Virgo Hotel, Piscis Hotel, Escorpio Hotel and Aires Hotel are the best higher end options. Should you prefer an apartment, there is a small, expensive market to pick up snacks, or to cook in your kitchenette, but most of the Las Lenas hotels have their own restaurants with good food and outstanding red wine options, including Argentina’s popular Malbec. Hotel Virgo, known as the best hotel in Las Lenas, has a spa, gym, sauna, jacuzzi, and heated pool. Massages are also available upon reservation, with priority given to hotel guests. PowderQuest does not book ski vacation packages or hotel reservations in Las Lenas (with the exception of our guided tour guests looking to extend their stay in South America). The small village, built in the early 80’s offers a bus line to access the shops in Centro Comercial La Piramide, the casino, restaurants, hotels, and nightlife. Higher end shopping can be found in the Hotels Piscis, Virgo and Aires. Most places are also within walking distance. The only night skiing in Argentina is in Las Lenas, maybe worth a few runs just to say you did it, but it’s located on the beginner terrain so unless you are just getting started, it’s best to save the legs for tomorrow. If you still have legs after a day on the mountain, Argentina’s famous late night bar and disco scene live strong here in the Las Leñas Valley. It is not uncommon to see folks pouring out of the discotheque as you are about to make your first powder turns of the day! This leaves the entire resort crowd free for hours. Nightlife can be pretty outstanding and runs very late. Some of the bars and discos do not get going until 2am and do not close until 6am, packed with beautiful Argentines and Brazilians dancing and sipping Fernet & Coca-Cola. It’s tough to balance the partying and skiing, but with an afternoon and popular bitter stimulant Yerba Mate (similar to green tea), you can probably find a good balance. The good news is many of the lifts turn until 5pm and there generally is not a huge rush in the morning to get first chair, unless it’s a bluebird powder day. Even then you need to be patient as the resort can take awhile to get things open after a fresh snowfall. So, there we go with our run down of the legendary Las Lenas ski area. Well worth the visit, especially if you are looking for steep terrain. A ski trip to Las Lenas should be on your adventure “must do list”.